On Saturday February 28th 1897 Nicholas II wrote in his diary that ‘a mass of snow fell during the night’. The following year the winter weather was mild. On Sunday February 28th 1898 ‘it was thawing and completely warm’. Thursday was ‘a nice sunny day, heavy thaw, the snow is almost gone from the streets’. 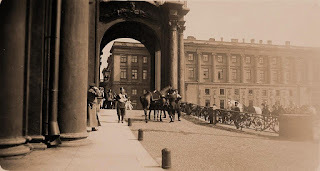 Two years later in the Winter Palace on Tuesday February 27th 1901 Nicholas wrote ‘the day remained marvelous and the snow has gone from the streets’. The next day he ‘took a walk in the marvelous weather’. A marvelous week here in Belleville Canada with sunny days and the snow gone from the streets!